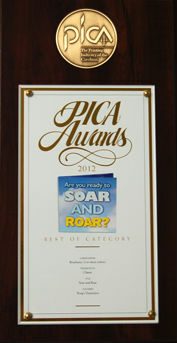 they are a winner of the 2012 PICA Awards! Uniquely Gray Design's Kings Dominion's 2012 Snake Fold Media Invite won the Best of Category for 4 Color Brochures for the Printing Industry of the Carolinas. The invite was produced by Carolina based printer Classic. This project has been a gem of Uniquely Gray Design since its creation. It allowed the studio to push its creative boundaries and experiment with difficult folding techniques, while creating a truly innovative piece for their client. The studio is very proud to have won Best of Category for this particular project! to the Greater Cleveland/Akron Area! And boy are we glad to be back in this wonderful area!